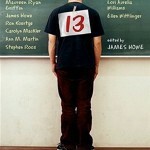 No one will want to skip any of the twelve short stories and one poem that make up this collection by some of the most celebrated contemporary writers of teen fiction. The big bar mitzvah that goes suddenly, wildly, hilariously out of control. A first kiss — and a realization about one’s sexual orientation. A crush on a girl that ends up putting the boy who likes her in the hospital. A pair of sneakers a kid has to have. 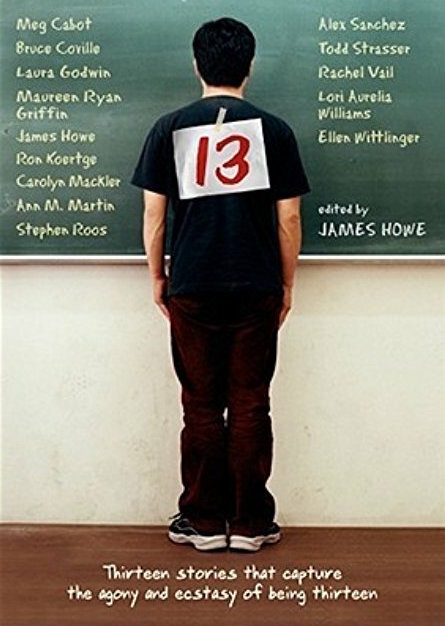 By turns funny and sad, wrenching and poignant, the moments large and small described in these stories capture perfectly the agony and ecstasy of being thirteen. This is a sweet little anthology about being thirteen that hits all the usual marks: bullying, trying to fit in, friend drama, first crushes. Each story has a distinct voice, but they definitely feel part of a unified whole. I really appreciate all the diversity: there’s a story about a bar-mitzvah, and a story about a boy realizing a group of friends might actually be a real gang, for example. I was really happy to see the bar-mitzvah story in here: looking back, being at the center of a big, important religious ceremony followed by being at the center of a big, (usually) expensive party must be a nightmare at that age. That is not really an age where you want the stakes to be that high. The stories are short and quick reads, but the characters are clear and fully realized. This would be a great book to give to a 5th grader as a way to bring up a lot of the issues they’ll face in middle school. In addition to being a good way to discuss middle school issues with younger students, the stories in this book can be great journal/reflection prompts for actual middle schoolers. If your school has some kind of character education or anti-bullying program in place, a lot of these stories can work really well alongside that. This book is perfect for upper elementary–I think they would enjoy it more than middle schoolers would.